I guess I was a little behind in my Insomnium news as I learned that a new guitarist Markus Vanhala is featured on the title EP track Ephemeral. 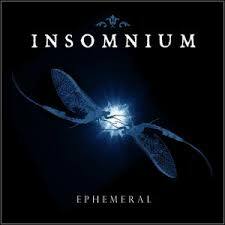 I am not sure how this affects fans of Omnium Gatherum, his former band, but he is now making an impact in Insomnium. The new song stood out rather quickly as I could hear the vocals a bit louder and the song seemed a bit more aggressive versus a more doomy, melancholy approach that initially attracted me to One For Sorrow. The new song is a worthy incentive to be patient for the 2014 release. It is loaded with signature Insomnium sounds, but just a bit more kick to it. The instrumental tracks are all on the darker, moody side. If you heard Decoherence off of their last album, these three songs fit that vibe. Overall, a nice little 12-minute package hold me (us) over until release date. Posted on December 4, 2013, in Album Reviews and tagged Doom, EP, Ephemeral, Finnish Metal, Insomnium, metal. Bookmark the permalink. Leave a comment.